Considering that sales of luxury cars might be down somewhat from years past, the list of best selling luxury cars November 2011 shows that buyers with a yen for luxury are still plunking down money or signing on the dotted line. What is interesting to note is how the top ten models shift from month to month. Here is a breakdown of the best selling luxury cars November 2011.
the month, selling a total of 8,358 units during November. Meanwhile, sales of the C-Class calendar year-to-date sales of 61,570 are up 14.3 percent year-over-year. 2. BMW 3-Series – Slipping one place from last month’s top spot, the BMW 3-Series had sales of 7,568 during the month of November. 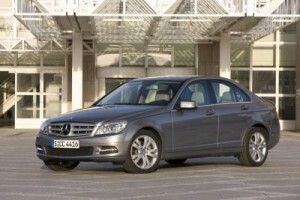 But for the calendar year through November 2011, even though its sales are off 5.5 percent from year-ago levels, the BMW 3-Series remains far out in front of the Mercedes-Benz C-Class, selling a total of 85,882 units. 3. Mercedes-Benz E-Class – Two spots behind its smaller brother, the C-Class, is the Mercedes-Benz E-Class, coming in at a solid number three spot of best selling luxury cars November 2011. Sales during the month totaled 5,095 units, good enough to move the E-Class to third place this month from last month’s fourth position. Calendar year sales through November totaled 57,435, up 3.9 percent compared with the same period last year. 4. Lexus ES – Another luxury model changing spots in the top 10 sales leaders this month is the Lexus ES entry-level luxury sedan, moving from October’s fifth place up to the number four spot. Lexus reported sales of 4,731 ES models during the month. For the calendar year through November, the Lexus ES sold 35,991, off 16.7 percent year-over-year. 5. Infiniti G – Make way for the Infiniti G, whose coupe and sedan models propelled it to number five sales position for November (up from eighth place in October) on the strength of 4,508 sales during the month. That breaks out to 3,623 sedan and 885 coupe sales. For the calendar year-to-date, the sedan is again the leader, with 38,360 sales (up 6.4 percent compared to the same period last year), while the coupe accounts for CYTD sales of 13,355, down 11.0 percent year-over-year. 6. Buick LaCrosse – In the top 10 best selling luxury cars November 2011, the Buick LaCrosse remains in the sixth position, selling a total of 4,008 units during the month. Calendar year-to-date sales of 53,114 are down 5.2 percent compared with the same period last year. 7. Cadillac CTS – Once again in seventh place, the Cadillac CTS (coupe, sedan, wagon and CTS-V variants) sold a total of 3,804 units during the month of November. Calendar year-to-date sales totaling 49,622 are up 22.6 percent year-over-year. 8. BMW 5-Series – In what has to be a blow to the automaker, the BMW 5-Series slips from third place in October to the number eight spot this month. That’s due to posted sales of 3,564 units during November. Meanwhile, calendar year-to-date sales totaling 46,604 are up 35.3 percent over year-ago levels. 9. Hyundai Genesis – No longer in 10th place, the Hyundai Genesis moves into the number nine spot this month on the strength of 2,702 sales during November. For the calendar year through November, the Genesis has sold a total of 30,528 units. 10. Audi A4 – For the second consecutive month, the Audi A4 appears on the list of best selling luxury cars, although it slips to 10th position this month from number nine spot in October. Sales of the Audi A4 totaled 2,501 sales in November. For the calendar year-to-date, the A4 has sold 31,512 units, up 1.1 percent compared with the same time last year.